i b i k e l o n d o n: The last stand in the battle for Blackfriars: take action! The last stand in the battle for Blackfriars: take action! In order to accumulate as much clout as possible, and to ensure all our cycling voices are heard coherently, bike bloggers, the London Cycling Campaign and others have agreed to consolidate the various rides being planned in to one. 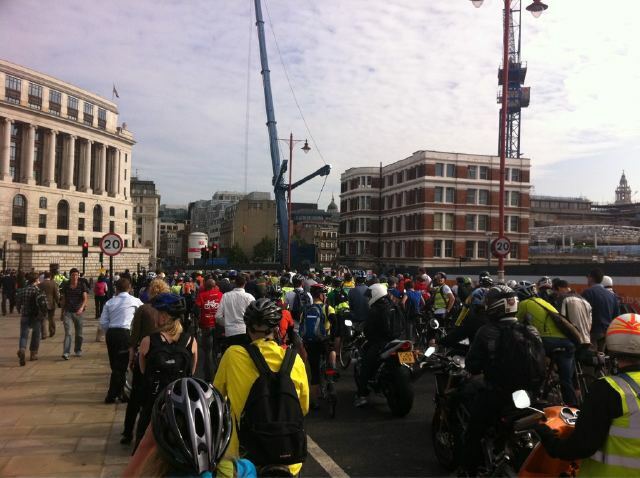 A go slow 'flashride' will take place on Blackfriars Bridge at 6PM on FRIDAY. Meet outside the Doggett's Pub on the south side of the bridge just before 6PM. This will then loop in with Critical Mass which sets off from beneath Waterloo just before 7PM - probably for an even bigger return to Blackfriars. BE AT THE FIRST DEMONSTRATION! Any possibly action on Monday morning is now under review as TfL have revealed they now expected their works to take 3 months, as oppose to be being largely completed by the end of the weekend. Please help spread the word. It's been rumbling on for months... letters have been written, petitions signed, rallies held and motions tabled. Despite all our protestations and the unanimous backing by all the parties at the London Assembly of a motion calling for an urgent review of the plans for Blackfriars, Transport for London intend to go ahead with their treacherous and terrifying junction plans anyway this Friday night. And all this in our so-called "cycling city" on a bridge where two cyclists have previously died as a direct consequence of TfL's design interventions and on a bridge where cyclists make up the majority of road users at peak time, despite being the most vulnerable. TfL had the gall to write, in their press release heralding the arrival of the works "The current and previous road layouts would simply not be able to handle the extra pedestrians that will need to negotiate the space around and across the junction adjacent to the new station entrance. The new design accommodates the huge increase in demand from pedestrians whilst improving facilities for the estimated six per cent of people who travel through the junction by bicycle." Dressing up the designs at Blackfriars as "improvements for pedestrians" is laughable. It's not pedestrians who will benefit from the increase in road space for motorised traffic from two lanes to three. It's not pedestrians who will benefit from the increased road danger and poor air quality brought about by increasing the speed limit from the existing 20mph to 30mph. And I don't know where TfL got the idea that bicycles make up 6% of traffic on the bridge - their statistics are scratchy at the best of times, and indeed the entire scheme appears to be based on out of date data which didn't reflect that cyclists now in fact make up the majority of road traffic on the bridge at peak times. Frankly, I am shocked and astonished at the cheek of it all. Indeed, according to a tweet by Green Party Assembly Member Jenny Jones TfL may well try to go ahead with their original plans from last May after all with no cycle lanes whatsoever. Could this really be true? Nothing surprises me anymore I am afraid. At the end of our tether? You bet we are. We've exhausted every single democratic channel available to us. We've fought long and hard engaging with politicians to get consensus from all sides. We've taken the time to ask people on the bridge to sign petitions. We've drummed up media support. We've organised 'flashrides', talked to journalists, even gone walkabout on the bridge with TfL representatives, and yet despite all this Transport for London has decided to pursue its own deadly agenda all the same. Remind me again who runs London? And the reason it's been dubbed "the battle for Blackfriars" is because what happens here will happen elsewhere in our fair city. Already there are ludicrous plans to run a new cycle superhighway down the middle of two lanes of fast moving traffic on Vauxhall Bridge, and to rip out cycle lanes at London Bridge and force cyclists to push their bikes through the station instead. Let it be known, and known widely: Transport for London only encourage cycling in London to alleviate their chronic over-crowding on the Tube. Once you are up on their roads it is each to their own. Things are getting worse, not better, which is why the many thousands of you everyday and ordinary people on bikes are being forced to make a stand. London Cycling Campaign, Cyclists in the City blog, Cycle of Futility and many others are calling on all London cyclists to join Critical Mass this Friday from 6PM (it meets beneath Waterloo Bridge outside the BFI) Be there and be prompt. For those who don't want to join the mass, or want to kick things off earlier meet outside the Doggett's Pub on the south side of Blackfriars Bridge ready to start a 'go slow' flashride across the Bridge. Those on the Critical Mass will soon join you. But here's the rub... Transport for London are expecting us. They know the strength of feeling about Blackfriars. They'll be waiting for us to do our protest ride on Friday night. Then the paint trucks and bulldozers will roll in regardless, the junction will be laid out to their hair-brained designs over a solid weekend of working, and come Monday morning their work will be done. They'll be expecting us to go away quietly and for their plans to appear, fully formed and unremarked, to "smooth traffic flow" and will assume they've won. The papers and the news media will have long forgotten Friday night by Monday morning and that will be that. Which is why - and I know it's a big ask dear readers - we have to be ready to do it all again when the time comes. Friday night needs to be HUGE but we must not be afraid to mobilise when nescesary. By Monday morning the new junction will be almost finished, TfL will have assumed they've won, and it will be up to us to say that we don't accept it, that we don't think it's over and that we won't stop until cyclists - all those bankers, designers, clerks, nurses, teachers and Mums with kids - riding across the bridge are kept safe and Transport for London start to really sit up and pay attention. By acting against the Mayor - their own Chair - and against the London Assembly, and against the many thousands of you who have written, Tweeted, blogged, protested and petitioned, Transport for London are slapping the face of democracy, crushing the broken bones of road safety and giving you all the finger in their desperate pursuit of a 'smoothing traffic flow' agenda. Dramatic though it may sound, it really is up to you and I now to shout as loud as we can to say enough is enough. I hope you will join me. Tell your friends, bring your families and let's all ride together. Meet outside Doggett's Pub on the south side of Blackfriars Bridge at 6PM PROMPT for a go-slow 'flashride' across the Bridge. This will then connect with Critical Mass at Waterloo which departs around 7PM. TfL's own surveys show that 15% of the cycle traffic crossing Blackfriars Bridge starts its journey from a rail station - basically that's Waterloo, and a residual effect form the closure of the Tube line to Bank for 6 months in 2006-07 Cycle use at Waterloo shot up as city workers found cycling a realistic replacement for 'The Drain' and this continues, ask any of the 500+ cyclists per hour pouring out through the main exit at Waterloo, check the Boris Bike hires between EC's mass issue site and the SW mass collection which rolls along at Waterloo. Get to Waterloo (or at the foot of the ramp on York Road) and encourage those key workers in the City to add to the campaign voices. They are very much a part of why cycle traffic across Blackfriars Bridge is booming at peak hours, and the reason that the bike parking provision at Waterloo has increased by over 1000% in less than 8 years, and 50% of the vehicle count on a City of London Street at peak times is cycles. many are in banking and finance. They talk 'money' and people listen to them. Wish I could get down to London to join you for this. When you're there on Monday, see if you can persuade people to turn up again on Tuesday. Even if it's just to ride across the bridge. It's decided then, I'll be taking the very long route to work on Monday morning to support you. Thanks for your suggestions and support everyone. For this to succeed we really do need as many different people to get involved as possible. I'm getting lots of messages of support and people telling me that they will be there which is great but please do tell your friends and spread the word! Together we can do this! I live close to Blackfriars Bridge and it is noticable that traffic will speed up on approach to that Bridge either from Blackfriars Rd or Southwark St. They do not slow down and so for cyclists it is a dangerous bridge. There needs to be a very strict traffic calming measure in place just as there is in the Limehouse Link. Nobody would dream of speeding there as it is strictly enforced.Cut the speed to 20mph and enforce it and watch the reaction of drivers.They will adjust their driving accordingly. I am wondering why you would go home over the weekend. Ride back and forth across the bridge in shifts from early Friday until sometime on Tuesday. Token half-hour flash mobs can be ignored; you have to be more stubborn than they are. And, eventually, bring your own paint. Turn their new auto lane into two bike lanes. As anon says, one-off rides may not work: But a go-slow at 6pm DAILY might raise some sort of awareness? And where precisely are the offices of those who came up with this? I was trying to figure it out on the 'net the other day? A weekly protest there might help? Anyway, good luck with your protest. It really does seem pitiful how so few, unelected petrol-heads can ruin the lives of so many. I wish I could be there, however at that point in time I'll be probably crossing the German border on my way to London. However I fully support any and all protest rides! I think an entire day of slow riding up and down the bridge is a brilliant idea and I bet there are enough dedicated people who would take a day of from work to participate. The paint is also a great idea although it's getting a bit illegal from there on... how about some temporary barriers, like they use for road works to create a bicycle lane? If a ride on Monday does happen count me in, and Saturday, and Sunday and all other days! Surface Transport based in Palestra - 197 Blackfriars Road, SE1 8NJ opposite Southwark tube.